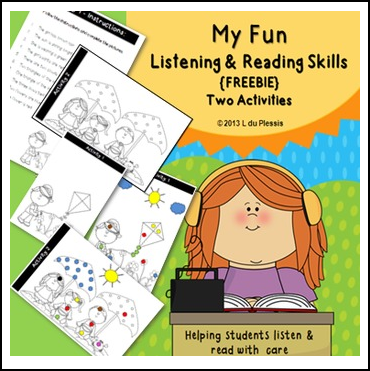 Listening & Reading Skills Summer Freebie. Students have to complete an activity according to a set of instructions. The instructions can be read by them or they can listen to the instructions (you read it to them). You can even project the instructions on your whiteboard to save paper. Color answer key included. You can project it and students can mark their own work. Such an excellent idea for Listening & Reading Booklet which is best activity for students in summer freebie. The main separations in language arts are literature and language, where language in language art refers to both linguistics, and specific languages. I am enjoying reading this blog and like this funny idea. I love to visit link of full version of a listening & reading booklet as well as love to provide best economics assignment help - http://www.assignmenthelpfolks.com/economics/ at moderate rates to students when they need to finish their assignments to their educators and teacher at Assignment Help Folks. Thanks for sharing such a unique idea. You are genius! Keep sharing!